WMF stands for Windows Metafile Format. Metafile means that this file contains information that describes or specifies another file. WMF was introduced by Microsoft. WMF saves space already-built comparing with bitmaps especially when many bitmaps are used repeatedly by different components of the operating system or of an application. The WMF file was created for a 16-bit operating system. For 32-bit operating systems Microsoft developed an enhanced metafile format (EMF). Microsoft's clipboard (CLP) file may contain an EMF file, a WMF file, or a bitmap format file (BMP). You need a reliable image converter to convert WMF images to other formats like TIFF, JPEG, GIF, BMP, PNG. 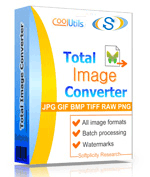 Try Total Image Converter. It converts files in batch and always keeps the highest quality possible.